8FOOTSIX: Don't knock yourself out! Somehow, the holiday season lost its magic for me. I always assumed that when you have kids, Christmas becomes an even bigger deal. The opposite happened. I want to do things for the boys to create memories...simple things. A tree. A few strings of lights outside in the front trees. Decorate gingerbread houses*. Make cookies. Advent calendar (he loves the stories!). Greetings cards. I gave up trying to be perfect. In fact, any time I try to create something beautiful, special, amazing, WOW!... inevitably, at some point, I get annoyed that there are two little ones under my feet. I am frustrated when something 'important' gets broken. Or I feel put out that I have the shortest window of time to accomplish it on the weekend. Or exasperated when the baby only takes a 30 minute nap. Or I stay up late to finish, and then I am tired the next day. Forget it! Why take the holidays and turn them into a huge stress-ball? What's all the fuss about? Today, my sons** and I hung up all the non-breakable ornaments (about 25% of my stash!) No garland, no star on top, no orbs, no bows, and, I think, they couldn't be happier! The non-breakables never seemed to fit in with the rest of the shiny pretty things, but they look perfect on their own! Well, maybe not perfect, but, you know, just right! ps. my three year old dug through the box of ornaments while my one year old napped for 1.5hrs!...this gave me a chance to hack away at the tree. I pruned away at the branches to really open it up. 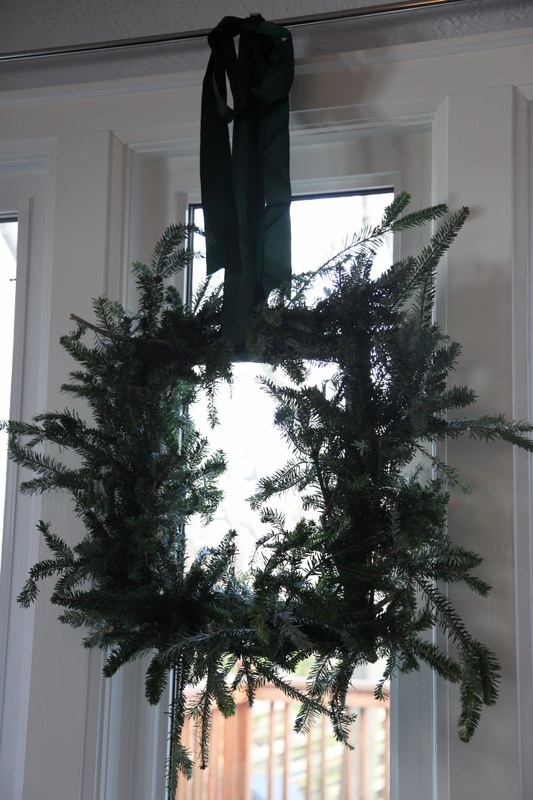 I used the extra branches to make a wreath, and decorate the mantle. pss. This was the fastest tree trimming ever! My three year old was a huge help! It was so funny to see him hang 18 ornaments all in the exact same spot...I encouraged him to try and give each piece its own special branch. We had fun! *We decorated a mini gingerbread house village, you can see it on the mantel! I am so, so, so with you! I've lost my Christmas mojo this year. 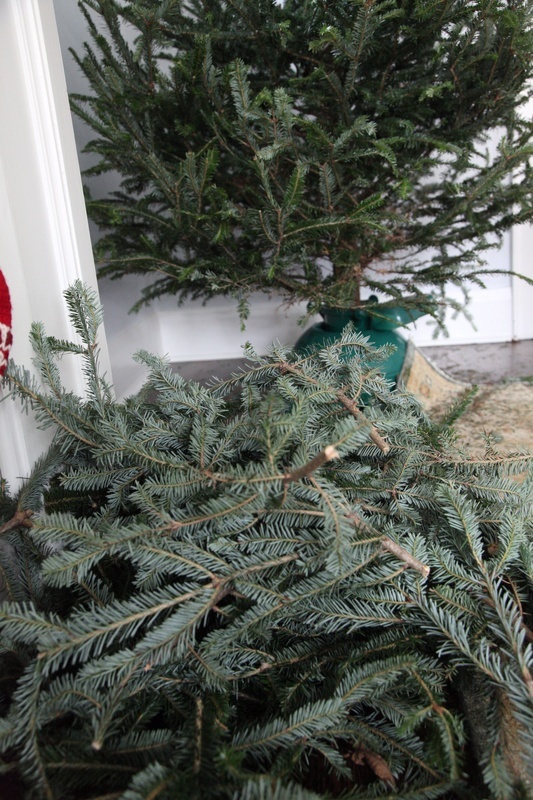 All of a sudden it seems way more important to actually BE a family instead of spending time worrying about my daughter hauling down our tree (we opted to not even have one this year). I think about 1/8th of my stash came out this year...I didn't even have the energy to haul it out of the basement. Looking at these pictures, you'd never know that you lost your mojo. In fact, I'd say you've discovered a pretty spectacular way to tackle the holidays. I'm in the same boat. I feel overwhelmed about putting up my tree and it shouldn't be like that should it? This is perfect. looking great! love that the little one helped and making the tree extra special for him ... and i'm sure for you as well! ooh! you got your tree trimmed! I hope it made you happy :) Your decorations look great! and three cheers for keeping things simple! 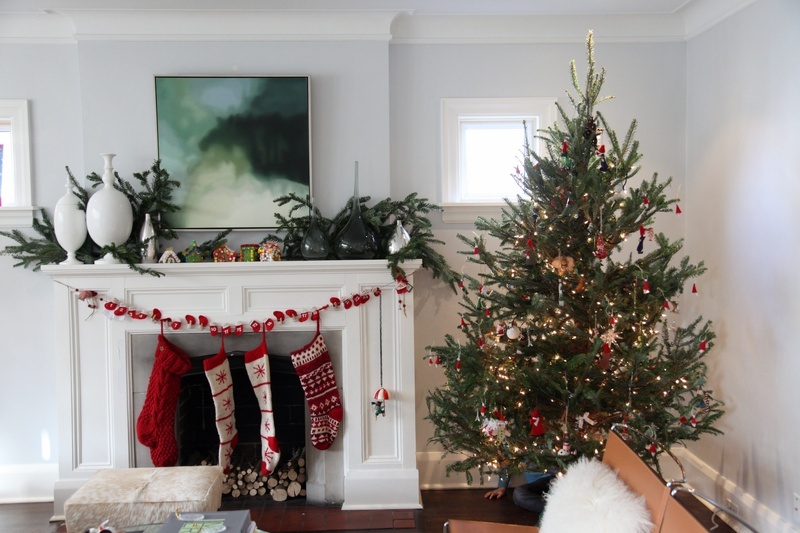 Shannon your tree and your mantle are beautiful. I totally identify with you about keeping things simple. I've found Christmas very overwhelming ever since I had kids with the expectation to "make it the best holiday ever!". I haven't found the right groove yet. i agree. simple is best, especially with little ones! most of ours now are ikea ornaments, with a few handmade. the kids and i still managed to break at least three decorating the tree..
love what you did with the hacked off pieces! we decorated the bottom 1/3 of ours with plastic ornaments... ugly but practical. Embrace the ugliness that this holiday has become! Fantastic. Best "decoration" goes to the little boy hiding at the base of the tree.....so very sweet. Ahhh! I wondered who would see him! He was hiding!! Love it when he hides and shouts out "MOM I'M BEHIND THE TREE"
Thanks Amy! It is a little more dressed up now than a week ago...with gingerbread man garland (we cut out and coloured) and cookies! I don't have any plastic orbs...so no orbs this year...just wooden things, and handmade things...and even a leather santa that is hanging upsidedown from him boot! Oh and little baby dolls from Zara home 2010! Thanks Amanda!!! It is a happy tree this year! Thanks Lisa! Simple is always a great plan...you know? I wonder if you got yours up!? I am waiting for the update!!! I have been giving sooo much away...I just don't want to own so much! The branches are attached to a needlepoint frame that my dad made me at least 15 years ago...It is like a stretcher! but a photo frame would work!